Quick and yummy, this is the mantra of today's cooking. We all need this kind of recipes now and then after a hectic/eventful day to feed our family something quick to make as well as delicious. In that category, this Indo-chinese recipes are always hit in my home. 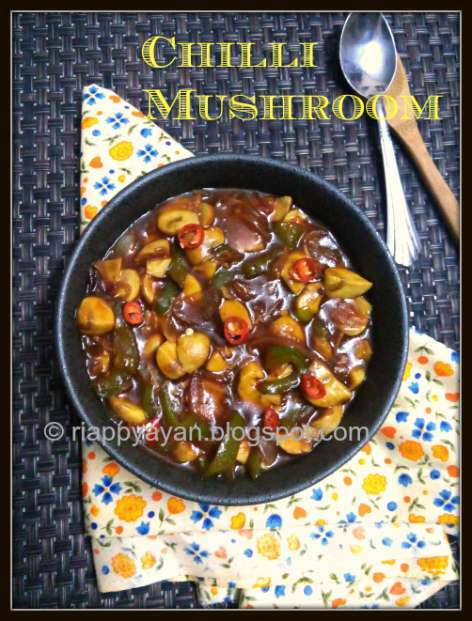 My kids don't love to eat mushroom, but if I make this chilli mushroom, all are happy. 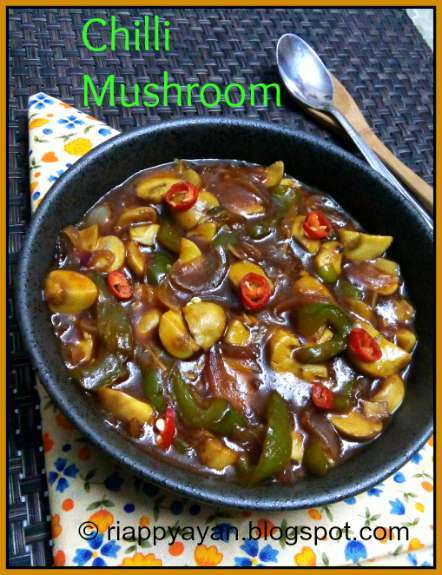 I serve this with Chinese Fried rice and Hakka Noodles or make as a side dish with a Mushroom Fried rice. It simply tastes yummy with plain chapatis too or with white steamed rice. 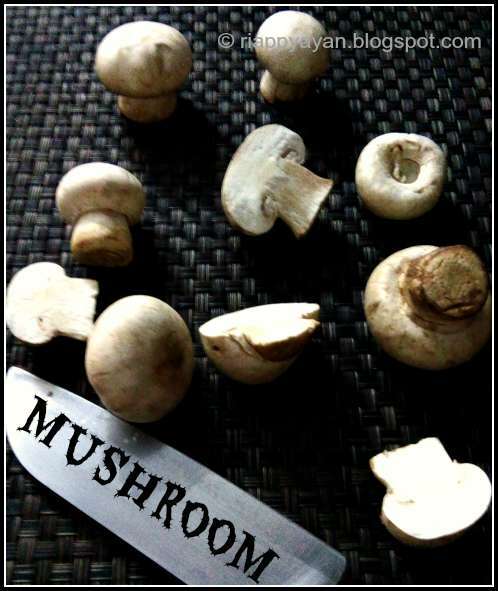 Mushroom(white Button) : 250 gms. Tomato Sauce : 1 tblsp. Clean the mushroom heads properly, then slice/chop them in big chinks as after cooking/sauteing it shrinks. Similarly, wash and chop capsicum in big chunks. Heat 1 tblsp. oil in a pan, saute capsicum first and then mushroom for 2-3 minutes. Remove from pan, then add 1 tblsp. oil in it, then add finely chopped garlic, green chillies and onions. Saute them for sometime, then add soy sauce, chilli and tomato sauce mixed with 2-3 tblsp. 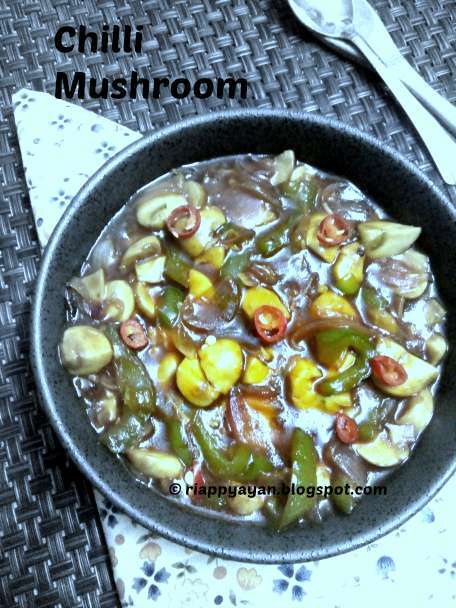 of water in it and cook in medium flame, add sauted capsicum and mushrooms in there. Add 1/2-1 cup of water in there if you want to make in gravy style. Let it cook for a minute or two, then add cornflour mixed in 2 tblsp. of water. Season with salt and a pinch of sugar. Check and remove from heat when you have your desired consistency of gravy. or just click on my Recipe Index page to find some similar recipes.